HÀ NỘI – Around 12,000 people die from tuberculosis each year in Việt Nam - that’s one and half times higher than those killed in traffic accidents over the same period. According to Nguyễn Viết Nhung, Director of the National Lung Hospital, Việt Nam is in the world’s top 30 countries with high TB rates. The country ranks 16th in the number of TB patients and 13th in the rankings of drug-resistant TB patients. Seventy per cent are of working age (between 15 and 55). Việt Nam, however, has been working hard to take practical measures to reduce fatalities and prevent TB in the community. It hopes to end the disease by 2030. Nhung said the number of infections decreased by around 4,000 and the number of deaths due to TB was also reduced by a similar amount. Multidrug-resistant TB cases are estimated at 4,900 people - significantly reduced from 5,200 cases in 2015. TB combined with HIV infected cases has also decreased from 7 per cent to 3 per cent in the period between 2015 and 2017. In the past 10 years, based on a national survey and auxiliary studies carried out in 2017, TB in Việt Nam has decreased by 31 per cent, reducing by an average of 3.8 per cent per year. In recent years, the rate of TB infection decline has been faster, especially after the Prime Minister promoted the National Strategy for TB Prevention and Control by 2020. 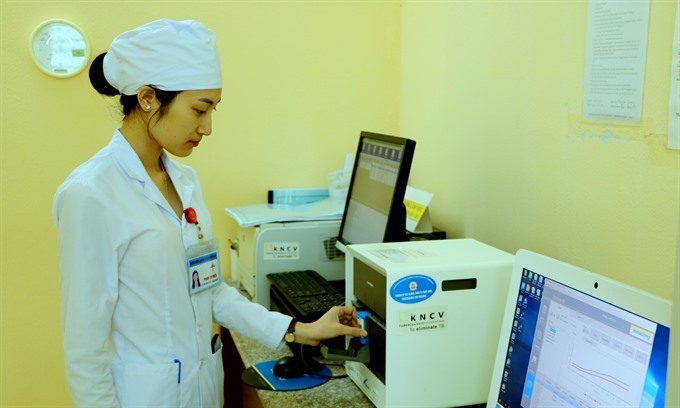 Việt Nam has also mastered the techniques of TB detection, diagnosis and treatment with good results, along with building a strong network system from central to local levels. "It’s an indication that Việt Nam is on the right track, which would also help the country continue to be a model for other nations with high TB problems," Nhung said. On September 26, 2018, for the first time in history, the United Nations General Assembly decided to hold a high-level meeting on the fight against TB, with strong commitments from the leaders of member countries. At the event, Việt Nam also made a commitment to end TB by 2030. Speaking at an event held on the World Tuberculosis Day on March 24, Deputy Prime Minister Vũ Đức Đam called for better communication work to improve awareness of tuberculosis to help them understand that the disease is not as bad as they may believe. “Although TB is an infectious disease, it is treatable and curable thanks to the advanced medical technologies”, he said. He also emphasised that financial mechanisms and application of new technology and treatment should be encouraged while people from all walks of life should help the fight against TB. Việt Nam has set a goal of ending TB by 2030, that is, with a population of 100 million, the whole country should only have 1,000 people suffering from TB a year. It is estimated that Việt Nam still has 124,000 newly detected TB cases each year. Some 64 per cent of TB patients and 98 per cent of TB-resistant patients bear the burden of high healthcare costs, for instance, spending more than 20 per cent of the income of the whole family in a year due to TB. “70 per cent of people with TB are at working age. Therefore, TB is really a problem affecting the economy of each family in particular and the country in general,” Nhung from added.